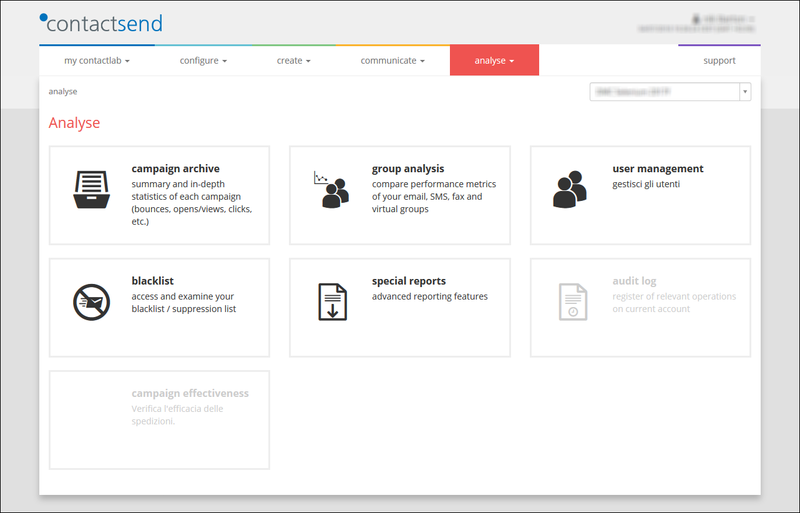 The campaign archive contains all the data (aggregated and disaggregated) concerning all delivered campaigns. In this section you can analyze the deliveries contained in the standard groups (groups email / sms / fax) or in virtual groups, or compare the results of multiple shipments in free selection. Enables you to explore the behavior of individual contacts with regard to the most recent deliveries or within a defined time period, manage a contact’s personal data and remove them from scheduled deliveries. The ContactLab blacklist is a mechanism that prevents dispatches from being classified as spam by the email providers and consequently being blocked. This area contains special reports (consecutive bounces, for example) which can be received by email.